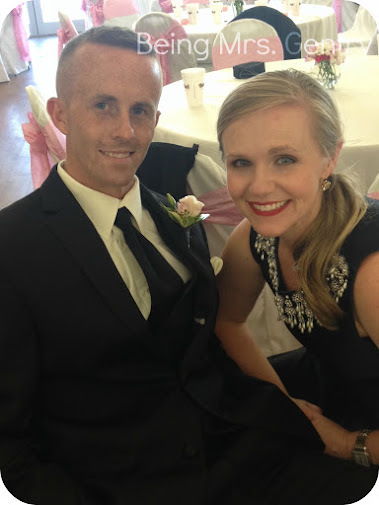 This past weekend my cousin was married in Waco, so we headed south last Friday afternoon. They asked Jack to be their ring bearer a few months ago, so we have been practicing his "Ringmaster" skills ever since, for that is what he called his position. In case you're wondering, Ringmaster skills include walking (not running!) down the aisle at the church with the ring pillow and smiling a picture smile at all times. Friday evening after the rehearsal at First Baptist, my aunt and uncle hosted the rehearsal dinner at Manny's on the River. 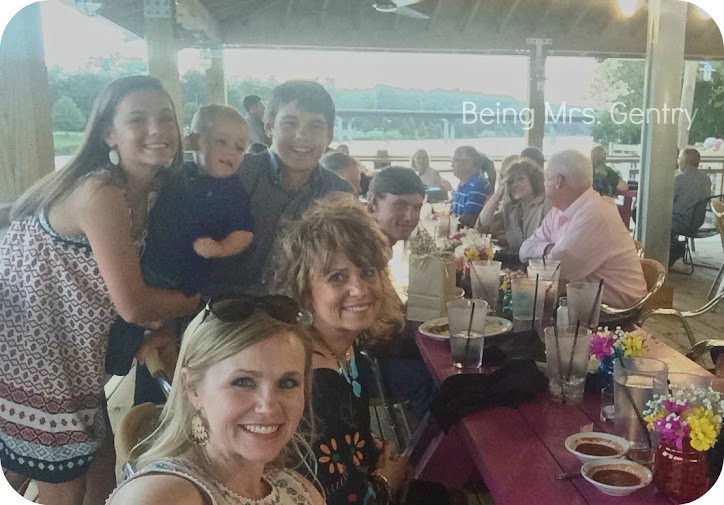 It was a perfect July evening for patio dining, and our whole party was seated on the deck behind the restaurant, right over the Brazos river. Photo compliments of my selfie stick! That night we stayed at the Waco Hilton. If we'd had a babysitter, we probably would've explored the area on foot quite a bit. Don't tell any Baylor Bears this, but we thought the area was slightly cool. We were directly across the street from the river on one side with a row of food trucks and across from the Spice shopping center on the other, with Ninfa's and a bicycle shop with rentals and such. Our room overlooked the pool and had a great view of the river straight across to the new McLane Stadium. The water was a little cold, and she wasn't having it. "I NOT get in the water. I put on my pink coverup, and I GO HOME." 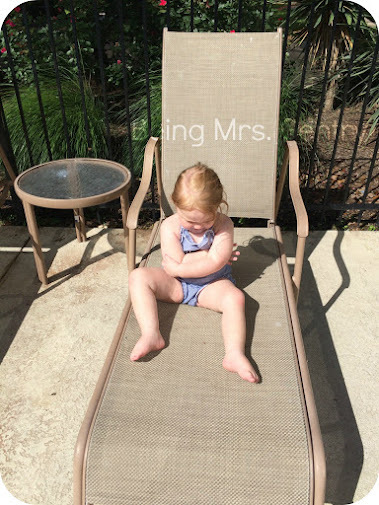 The next morning Mr. G made a Shipley's donut run (we don't have them here at home), then we dressed and went to the pool wear our kids out in time for early naps. 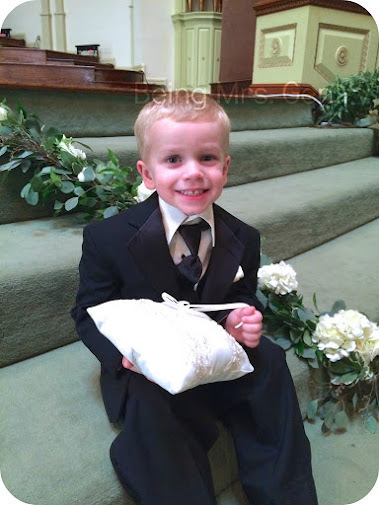 It was a 6 PM wedding, and Mr. G - an usher - and Jack had pics at 4. A bit of our fam was down there, so we had a good visit with them and the groom before the day got super busy. It was a sweet wedding, officiated by my grandfather. The reception was at Knox Hall, where they had BBQ and dancing. I think it was one of the best visits I've had with my whole family in a while. We saw the bride and groom off in a shower of bubbles, then put our little folks in their PJs before driving back home to our own beds. 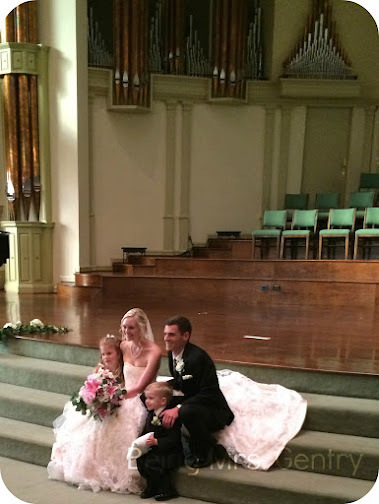 I can't wait to see the photographer's pics; she got a great one of our family of four! It was such a fun time, and we're so glad to welcome Cari to our family! So fun! That sounds like a perfect weekend celebrating family. Love your dress and lipstick! And I totally feel you on running out of time for your own hair after getting everyone else ready. Mine often ends in some type of bun for this exact reason! I don't know how it always happens, no matter how much time I give myself. I'm growing it back out now to make the bun easier to put up! Aw, he looks so handsome in his little tux! And we have been meaning to head back to Waco, too. Such a cool place, but we're always there just for a few hours.